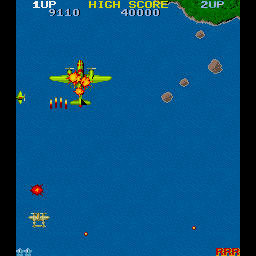 In 1942, your objective is to make it through the 32 varied stages of attacking enemy planes in your WW2 fighter plane, collecting the powerups on the way and destroying as many enemy planes as possible. Each 4th stage is named after a famous WW2 air battle (Midway, Marshall, etc). The game is set across several stages, all numbered, which get progressively harder. The enemy planes attack you in formations and your plane is armed with a forward firing gun which destroys enemy planes on contact. There are several different types of enemy planes you must encounter, ranging from those which simply move down the screen firing a shot or two when they get close to you, to large bombers which take many shots to be gunned down. There are also bonus plane formations which when destroyed release a powerup. When collected, this can take the form of doubling your shot power, rapid shot-firing ability, destroying all enemy planes on screen (with points for them), or even two smaller planes which fly alongside you in a tight formation, increasing your shot power. As well as your front mounted gun, your plane also has the ability to loop the loop; this allows you to fly a 360 degree loop which makes you indestructible while it is in progress. You gain a few seconds vital breathing space while you perform a loop, before re-entering the fray. At the end of each stage your plane lands back on your aircraft carrier, bonus points are awarded for the percentage of enemies destroyed and you gain an extra loop ability up to the maximum of three. There are several different types of enemy planes, each with a different attack ability. 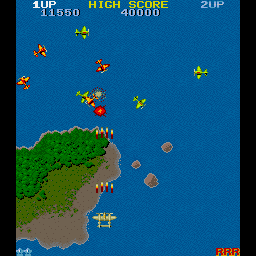 The smaller planes can swoop down the screen, fire bullets at you, barrell-roll in towards you, or even loop back up the screen, and in later stages loop back down again once more. There are medium sized planes which simply move up the screen before turning and flying back down the opposite side, firing more bullets than the smaller planes. Then there are the large bombers which move a lot more slowly than any other enemy plane, but they also fire a lot more shots, and take more hits to be destroyed. When you lose a life, you lose ALL of the powerups you have gained. You start the game with 3 lives and extras are awarded for 20,000 points and every 80,000 points. Scoring Small Plane: 30 or 50 points. Medium Plane: 1,000 or 1,500 points. Large Bomber: 2000 - 3,500 points. End of level bonus: 5,000 points for hitting 85% or over. End of level bonus: 10,000 points for hitting 90% or over. End of level bonus: 1,000 points per loop remaining. Look out below! 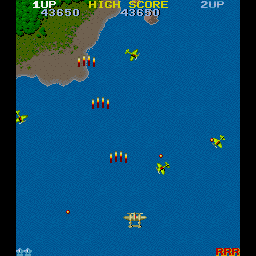 The large enemy bombers always appear immediately below you, so you must move to one side to let them pass before moving back below them to shoot them. As you only have 3 loops, use them sparingly. Only loop when death is certain. The small enemy planes always fire as they move down the screen, and not on the way back up. The medium planes always exit the screen on the opposite side to which they enter. You should always be able to destroy them before they leave. When you have the extra two small planes alongside you, note that if they are shot, they are destroyed and not you. So don't worry too much about losing one or both. The higher up the screen you are, the sooner the small planes loop, so you can force them to loop by moving up.